Year Round Pool Company is proud to offer our customers the Paramount PCC 2000 Pool Cleaning & Circulation System with Patented “Collection Zone” & Automatic Debris Removal. If there’s one thing you want when you own a pool … it’s leisure time! Your P CC-2000 pool is practically maintenance-free when you have it built with an in-floor, self-cleaning system. Swim and enjoy your pool even while the cleaning system is in operation! How does it work? 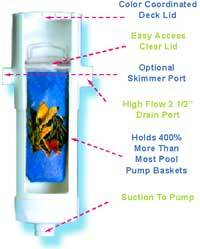 The PCC 2000 uses a network of strategically placed pop-up cleaning and circulation nozzles built into the pool floor. By evenly circulating the water throughout the pool, the dirt, sand, debris and leaves are pulled into the active bottom main drain. The debris is then pulled into the Patented Collection Zone and gathered in the convenient Deck-Top “Debris Containment Canister.” All you do is empty the canister. It’s that simple! The patented PCC 2000 can be designed to clean love seats, steps, spas, bar stools and fountains. Better Circulation Saves You Money on Heating and Chemical Costs! The PCC 2000’s patented water circulation system actually improves pool water quality by effectively circulating chemically treated pool water to all areas of your pool’s interior. This means that your entire pool is kept free of harmful bacteria and algae, and requires less chemicals to maintain a healthy swimming environment. Extend Your Swimming Season! The PCC 2000 system turns your pool into a passive, solar-heated pool. Complete bottom-to-top circulation eliminates those annoying cold spots, so your pool maintains even temperatures throughout – extending your swimming season enjoyment and energy savings!